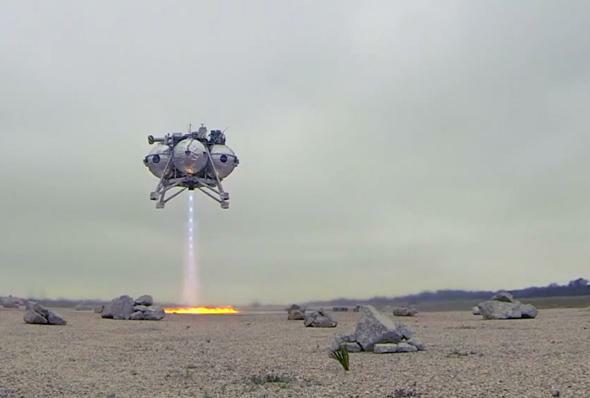 Morpheus lander: VTOL test package video. Amazing! Mind you, no one was at the controls there: Morpheus has an autonomous navigation package onboard, allowing it to pick a safe place to land that is open, flat, and free of obstacles like boulders. Morpheus is an innovative NASA research project to investigate how to explore strange, new worlds. The best way to deliver probes to the surfaces of small bodies like moons and asteroids may be using a robotic probe like this one. Interestingly, the lander uses a mix of liquid oxygen and methane, “green” propellants, which are easy to both manufacture and store. Once we have a foothold in space, they shouldn’t be too hard to produce out there as well; methane is a simple organic molecule (one of the simplest, really, just one carbon atom and four hydrogen atoms), and oxygen is needed anyway for astronauts to breathe, so it’s a safe assumption that we’ll have ways of producing it once we’re back in space to stay. For my money—and hey, it is my money, and yours too—this is what NASA should be doing. They should be breaking new ground, testing new systems, trying new things that may or may not work but which hold great promise. Simply put, there are some things governments can do best. There is a large pool of money and brain power, so a great spread of ideas can be brought to life to see what they can do. Some will succeed brilliantly. Many, perhaps most, will fail, which is the nature of science and exploration. But we are able to learn from those failures and find out ways to avoid problems, which can streamline and improve the successes. Private companies have a harder time with this in many cases; they have a bottom line to protect and shareholders to report to. That’s fine, and just means their mission should be different. Let governments clear the path, and let companies follow up. Once the technology is tested, succeeds, and becomes less expensive, private business can step in. This is precisely what businesses like SpaceX have done, using NASA legacy to create even better and less expensive rockets. It’s also why I remain unconvinced that NASA should be building a heavy-lift Space Launch System—it’s not innovative. It may be something best left to the business sector. NASA has a history of overdesigning things like this; the Shuttle, for example, was a magnificent machine, but it never delivered on the promise of fast, cheap, routine, and bi-weekly launches to space. It couldn’t. Building a routine-use “space truck” is not what NASA should be doing; it’s not what a big government agency is designed to do. Unfortunately, NASA is a government agency, which means an ever-shrinking budget and politics dominating its mission. That’s too bad; being forced to create missions by politicians isn’t the way to explore the Universe. We should allow the scientists, engineers, and dreamers in the agency to be free (within reason) to pursue the ideas they need to extend our grasp beyond this planet. But I still have hope, great hope. Projects like Morpheus show that these dreams still exist, and are being made real. If we can get past our own internal squabbles, perhaps then we can create our toehold in space. And perhaps then we’ll deserve it. Correction, March 9, 2014: Due to a brain hiccup, in the original article I accidentally wrote that methane had four oxygen atoms, not hydrogen atoms. It has been corrected.